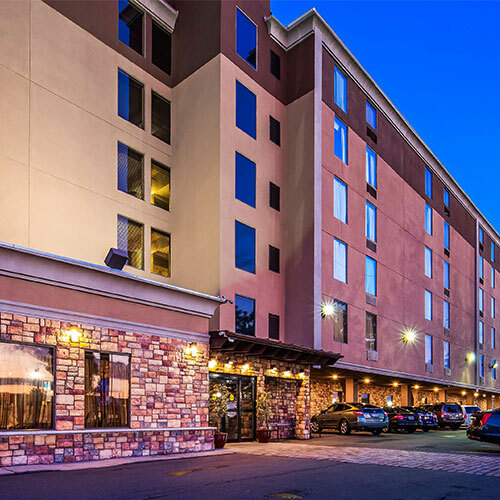 This popular hotel is located near the airport in an industrial neighborhood, but there is ample parking. Rooms are varied in style and some have attractive, marble-clad baths. This is a great low-cost choice for traveling convenience, and they offer park-and-stay rates. As there is not much else in the immediate area, the comfortable social lounge area is a good lively option and an oasis for the traveler. Smoke free premises. 83 units. 6 stories, interior corridors. Accessibility (Call). I-95 (New Jersey Tpke) exit 14 to US 1 and 9 S, then 1 mi s. Located in an industrial area set back from the highway. 101 International Way 07114.
valet and coin laundry, airport transportation, room service, area transportation-Newark Penn Station & Jersey Gardens Mall.